As a cat person, when you get to take a break from changing litter boxes, cleaning up hair balls, and wiping fur off the furniture and your clothes to go to a fancy event (the 20 year anniversary/ fundraising gala for the Cat Network of Miami), you really take advantage of it. 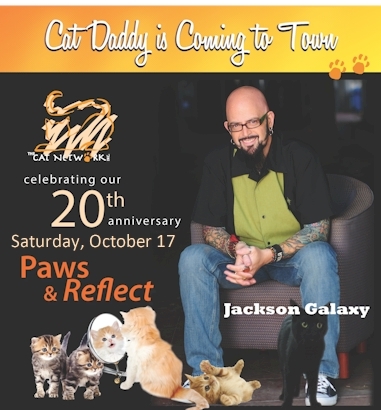 Especially when the scheduled guest speaker is none other than the Cat Daddy himself, Jackson Galaxy of My Cat From Hell! The event was last Saturday and I must admit I felt like Cinderella getting ready for a ball. I broke out my fanciest cat ears (gold sparkle lined), curled my rat’s nest of hair, and put on my swankiest gown (also known as my only gown). I was escorted by my handsome Prince Charming, Dan (who happens to be my favorite Cat Daddy), and off we went to enjoy an evening of cocktails, gourmet vegetarian food, music, and a silent fundraising auction. When we arrived, I was immediately impressed with the number of people and organizations that had donated items for the auction. 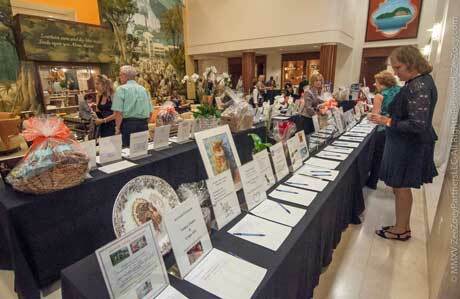 There was so much stuff to bid on that they actually needed several rooms to hold it all! 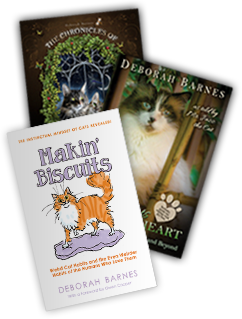 I had contributed several of my books – The Chronicles of Zee & Zoey and Purr Prints of the Heart and was relieved to see that by nights end they had brought in some nice donations! 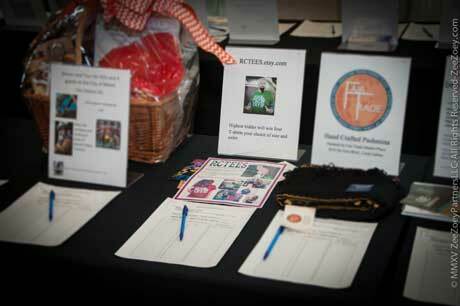 There was room after room filled with great items to bid on! Our friend Toni Nicholson from RCTees (known for her wildly popular “Real Men Love Cats” T-shirt) donated some items for the fundraiser! Thanks Toni! Here I am in my cat-ear, gown-wearing glory as I stand next to the books I donated. You can’t see it, but I promise I am wearing leopard – my shoes! I also got a chance to catch up with Christine Michaels of Riverfront Cats who is always my favorite accessory (who doesn’t look good standing next to her?) 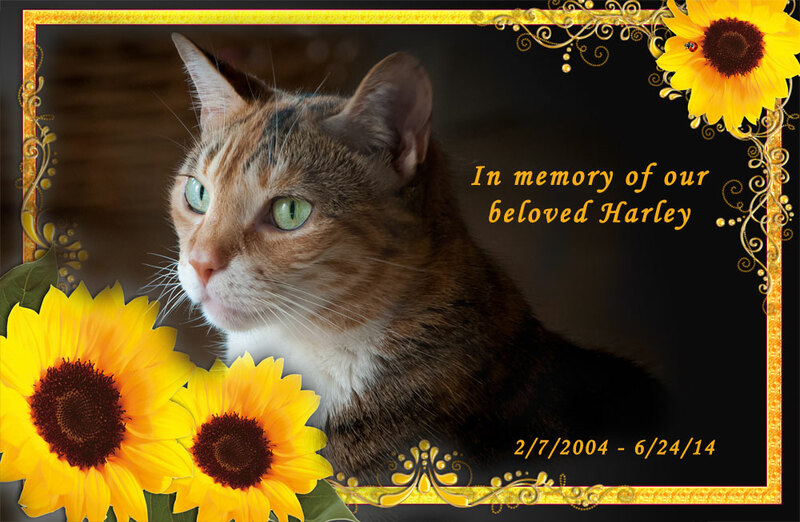 along with fellow cat loving friends, Cathi De Meo Marro of the South Florida Flute Orchestra and Jodi Ziskin of Healthy Cat Pro (Dan and I had previously met them when we attended the Global Pet Expo in 2014 that resulted in us bringing home our sweet Jazmine). The highlight of our chat was when we all took out our cell phones to share pictures of our feline babies! This is where Cathi (who also played the flute for the event), Jodi, and I shared pictures of our kitties that we had on our iPhones! I absolutely love this image of Cathi and Beth Hackney (a fellow cat lover that I met for the first time that night). They played such lovely music and it was so nice of them to donate their time and talent as part of the event. A classic photo taken with Christine Michaels. Doesn’t she look radiant!? This is Erin – we made his night when we asked him to pose with us as we nibbled on some of the most delicious appetizers I have ever eaten – a yummy concoction of phyllo crust, brie, walnuts, honey, and brown sugar! That’s what I love best about cat related events – where else can you so comfortably mingle in a sea of ladies wearing cat ears and openly share pictures of your furbabies? 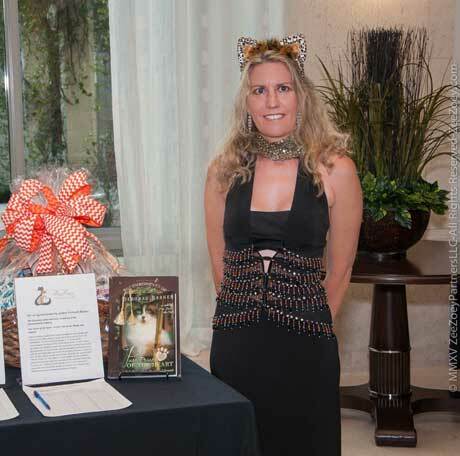 In that regard, thank you so much to the Cat Network – they did a wonderful job coordinating the gala and have much to be proud of – an organization that started in 1995 with a handful of compassionate women looking to help stray and abandoned cats on the streets of Miami has grown to over 2,500 volunteer and donor members. 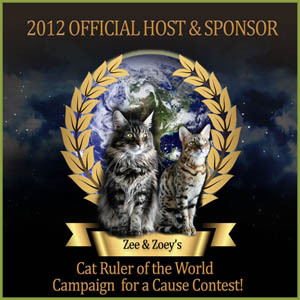 They have trapped and sterilized over 51,000 stray and abandoned cats and have adopted out over 7,000 cats since 1995. And their mission, “to make everyone aware of this huge community problem and to be proactive in fighting it by spaying and neutering pets and strays,” remains strong and true. They are also working diligently to make South Florida a No-Kill community and that’s why Jackson Galaxy was the perfect guest speaker, because that’s who he is at his very core. Ever since I’ve known him, his wish has been for a world in which no animals have to die needlessly and he continues to work to make that dream a reality. I had heard Jackson speak previously in 2012 at the Cat Writers’ Conference in Los Angeles and that talk centered around his first book, Cat Daddy – What the World’s Most Incorrigible Cat Taught Me About Life, Love, and Coming Clean. Jackson Galaxy in 2015 is a different person. He is still a cat lover and he is still covered in tattoos, but he is a household recognizable name now. A brand. 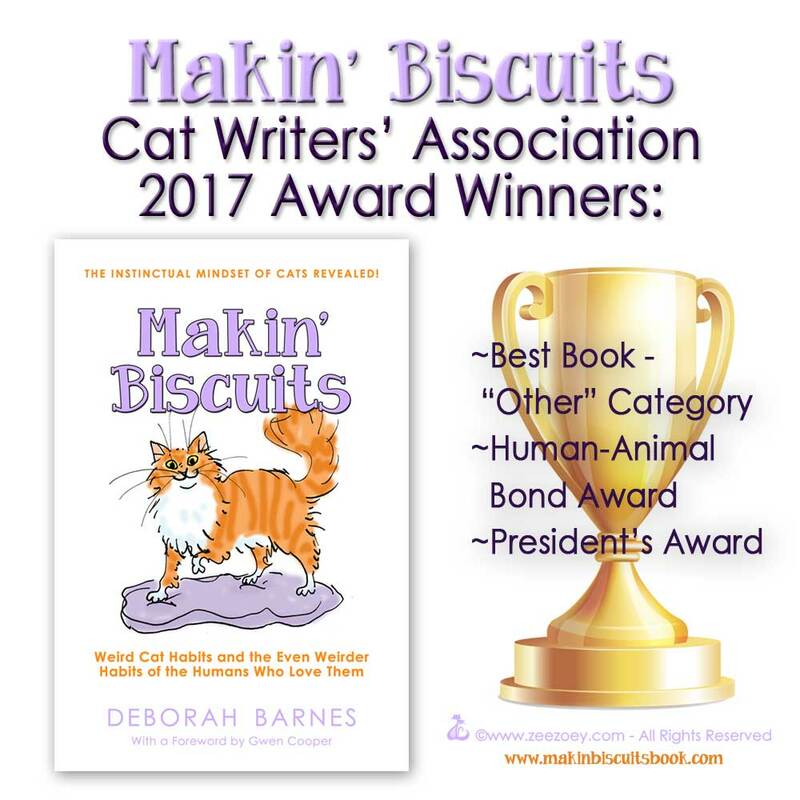 Rather than focus on his books (he has since written two more since Cat Daddy), or his show, his speech was about what we can do as cat ambassadors to get people to be more accepting of cats so that more of them are adopted into homes and not brought to shelters in the first place. Jackson makes his grand entrance up to the podium!! Jackson makes himself at home as he begins his talk! Any guess which person is me in the audience? Geez… what gave it away? 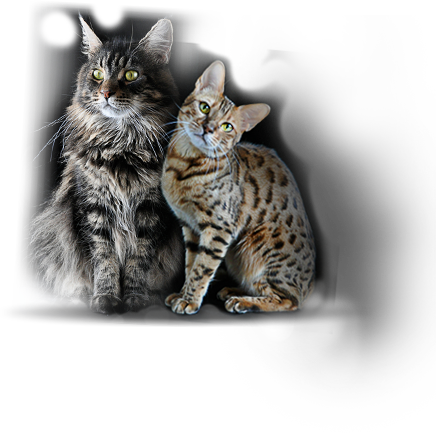 His solution – by providing the best “mojo” we can for cats so that they can live in an environment that lets them establish territorial ownership along with their pre-wired disposition to hunt, catch, kill, and eat (mojo is defined as walking through the world in the minds-eye of a cat and learning what it is that motivates them). He says if those things aren’t in place, especially the ownership aspect, then bad things can happen (after all, cats have really only been living in homes with us for about 120 years). He puts cats into three categories, and for him, he strives for every cat to be a Mojito cat. A Mojito cat is the one that has that John Travolta swagger – a cat that walks boldly into a room with her tail held high with a relaxed, backward question mark hook to it. She is a happy, let me weave in and out of your legs kind of girl who is confident in her surroundings. 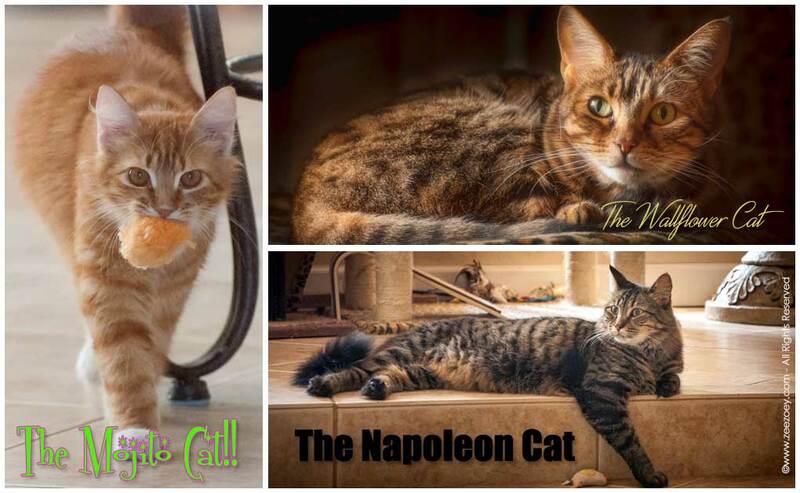 The Napoleon cat is the one that is insecure. He needs to prove something and will puff his chest out in an offensive, aggressive posture. He might lie down across the doorway of a house to make sure you have to step over him and he might pee on things because he doesn’t trust his ownership of the territory. Lastly is the Wallflower cat. She is the one that politely hopes you won’t notice her as she sneaks by to use the litter box. She hugs the wall as she walks by and you never see her in the center of the room because she doesn’t think she is the owner of the territory, nor does she want trouble with whoever is. In our house, Jazmine is the epitome of a Mojito cat. Kizmet is more of a Napoleon, and Mia a Wallflower. I must say, however, that for the most part, all of our cats are Mojito cats. We make sure to provide them with the best environment we can to let their inner mojo flow and it really works to keep them all happy and healthy. 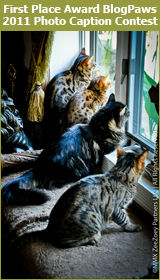 Whether through hunt and play games, vertical space for cats to lay claim to, proper diet, veterinary care, and spay/neuter to help keep the personalities and health in check, the point is to try to get all cats as confident as we can of the territory they live in. That’s when the magic – the mojo – happens and those people that had doubts about whether or not a cat makes a good pet, well, now they become believers. After his talk, the event ended with a picture taking meet and greet which was a lot of fun. Jackson was a great sport and all in all, the Cat Network put together a wonderful event. I thoroughly enjoyed hanging out with so many great cat-minded people and I hope they were able to raise lots of funding to help with spay and neuter, fostering, educational efforts, and more. After the talk, I get a hug from Jackson. Life can’t be that bad if you get a hug from Jackson Galaxy, right!? A more traditional pose with Jackson! So cool! 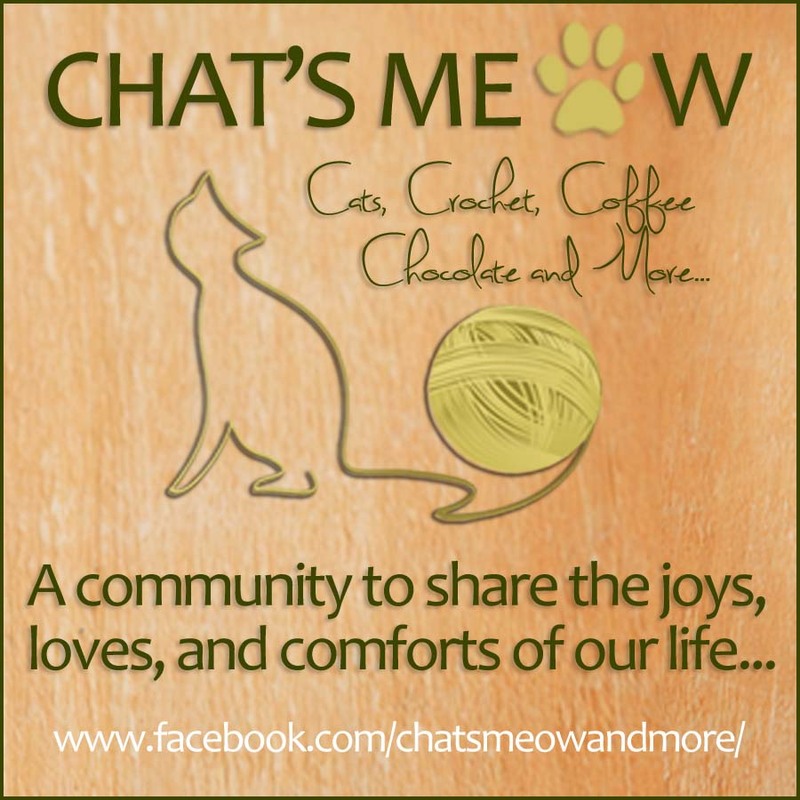 For those of you that were unable to attend the gala but would like to learn more about cat mojo and the Mojito, Napoleon, and Wallflower cats, please check out this video from Jackson in which he discusses it in detail! 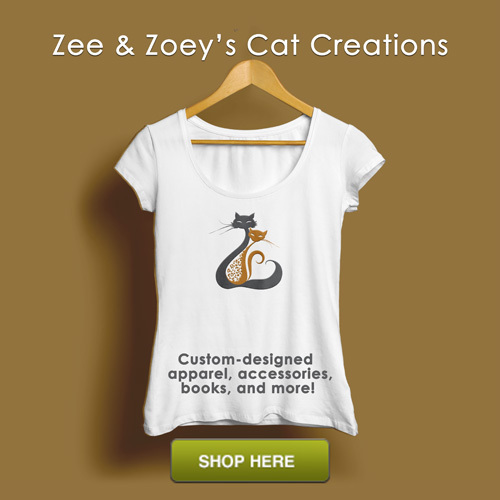 After you watch it, let me know – what kinds of cats do you have? 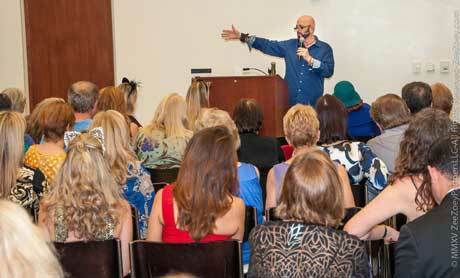 To be in a room full of cat advocates, plus you PLUS Jackson Galaxy–wow! The only thing missing for nirvana were cats! Another wonderful spent with you and Dan and our love for cats. 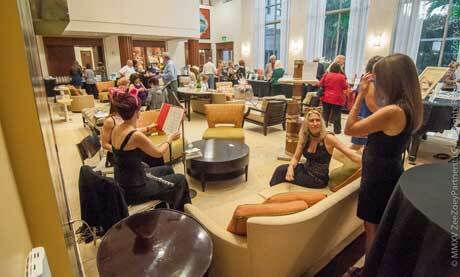 Thank you for another excellent writeup although you radiated that night not me. I looked like cat dragged me out of bed–wait! My cats did. I was napping before event. It was great to hear about Jackson’s assessment of three personality types of cats. I would say I have 4 Mojito cats, one Napoleon, and one Wallflower. To hear him talk about going beyond trapping and rescuing and the great need to educate people was so reassuring–that’s exactly what we do at Pawsitively Humane and Riverfront Cats! We’re not just in trenches, we’re are spreading the word, teaching people hands on, and showing them cats are cool! You really summed it up with your pawsome comment, Christine!! I am so happy to be a part of Pawsitively Humane and Riverfront Cats. The message Jackson shared was so upbeat and hopeful. Very refreshing in a world that can be filled with so much negativity and despair. Both Carmine and Milita are Mojito kitties! That’s so cool that you got to meet Jackson on his first tour, Fur Everywhere! And I’m not surprised that Carmine and Milita are Mojito kitties! 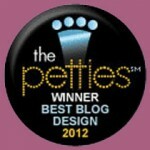 Oh, how I would have loved to have been there with you, but your wonderful write up and photos are the next best thing! You look wonderful, as always. 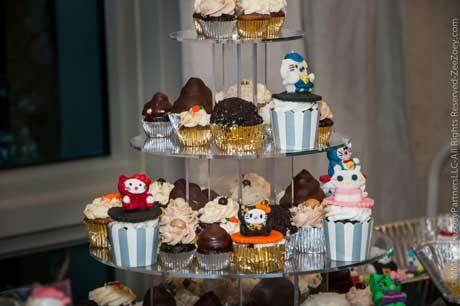 Thank you Ingrid – the icing on the cake would have been if you were able to be there with us! How exciting for Jackson to get to be in the same room with you and Christine! It sure looks like it was a fun, fun time! It was a lot of fun, Brian – and how sweet of you to put Christine and I in the forefront like that!! You are such a gentleman! 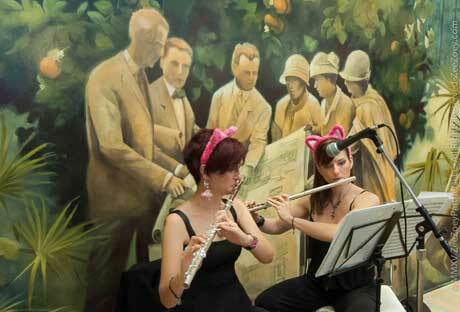 I do love the photo of the flautists….in their cat ears. Priceless! But my favorite is “the entrance” and “the hug”….brings tears to my eyes (I’m such a wimp). I agree Deb, the Jackson of 2015 is a much bigger, better version of the old Jackson. I have never been happier to see someone’s success and see what he does with it! What a Catman! I’m so happy you got to share the evening with him, Dan, Christine and all the other wonderful cat advocates. 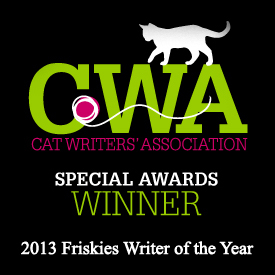 Thanks again Deb, for sharing your wonderful talent….writer extraordinaire. Thank you Toni – you are always far too generous with your compliments, but please, by all means, keep them coming! Glad you were able to virtually enjoy the event and you were definitely with me in spirit! 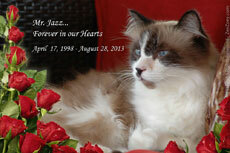 It truly was wonderful to be around so many cat lovers – I am blessed and the hug from Jackson was a fantastic bonus! 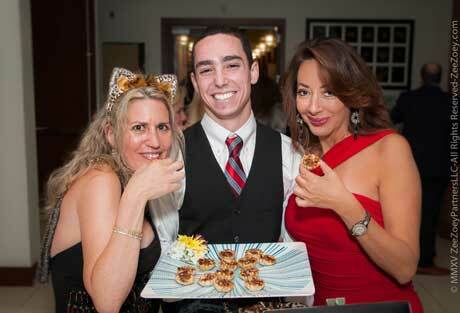 What a fabulous event you were lucky to attend, looking gorgeous in your trademark cat ears and dash of leopard! 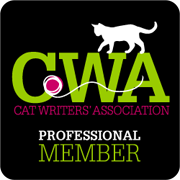 I am honored to know such a committed cat advocate and fellow cat Mom as you, and always inspired by your work on behalf of kitties and the passionate way you write about it. 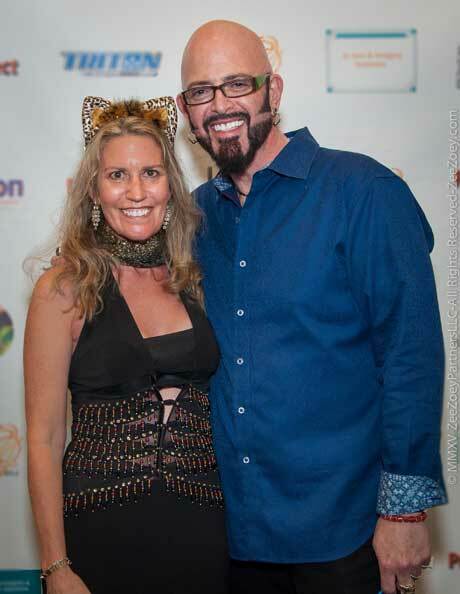 I wish I could attend such a posh and lovely event and get to meet the amazing Jackson Galaxy, he has definitely made a huge difference educating the public about cat behavior aka mojo and making men who love cats unafraid to boast it openly. My two fur kids definitely fit in to the mojo types, with Clove being a Wallflower. Abused and abandoned before she adopted me explains a lot of her mistrust and insecurity with others and her environment, but this is something we work on everyday to try and get her as close as we can to that Mojito status. I see strides in her everyday and it warms my heart to see her have fleeting moments as a Mojito kitty, making me hopeful one day she will find that unwavering confidence. My senior former feral/foster fail Kaspars is what I would describe as a mix of Napoleon and Wallflower with occasional Mojito mojo. His days on the streets and as feral have left long lasting imprints of mistrust and fear, yet with his desire for love, belonging and affection he has slowly come from allowing fleeting moments of being petted to approaching you for belly rubs and head scritches. He loves to be outdoors 80% of the time, patrolling his yard from intruders or passers by and enjoys accompanying his fur sib woofie Sophie on daily walks about the neighborhood. It is during his watch cat and canine bodyguard walk duty that you see his Mojito mojo shine- confident and secure of his role he is unafraid of fellow cats, humans or dogs and he will confront any species with a growl if he suspects them of threatening his woofie sister. He has been known to chase a boxer he felt was a threat to HIS dog down the street, it whimpering as it looked back to see him on its trail until it reached home! Whichever and whenever the different types of mojo appear in my cats, I adore them and like you feel they are deep down Mojitos happy in their home and the role they fulfill as members of our family. Of course as a Mom I would love to see their inner Mojito all the time, but just knowing it is there gives me reassurance we have made progress and there is real hope we will get there someday. Kitties Blue – no need to be jealous!! I am sure you will get a hug from Jackson one of these days too! Glad you enjoyed the video – it did a great job of recapping his speech! Thank you for stopping by Katie Kat and Ellie May. I’m not familiar with cats being afraid of smells – I do hope Jackson is able to come by one day! It looks like you had such a wonderful time! I adopted my first FIV+ boy from The Cat Network, then his brother joined us the following year. They are such a wonderful organization! Most rescues wouldn’t take a chance on a cat that was FIV+, required eye surgery and wasn’t sociable, but they did, and this cat became my sweetest angel. They were both amazing boys. Thank you so much for sharing that information, Michelle. They are a great organization and I am so happy you were able to able your sweet boys. Our kitties used to be Wallflower cats when company came too, Swiss Cats. As time has moved on, they have come to realize that the company always leaves, so it’s not that big a deal anymore! We love Jackson Galaxy here in this house!! 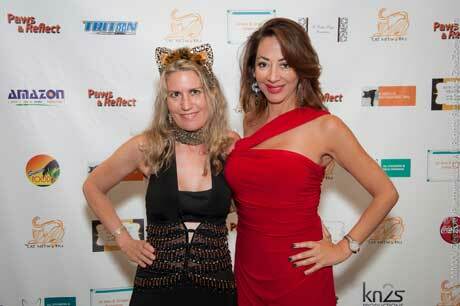 Loved your blog about the Paw & Reflect 20th Anniversary Celebration. So glad you and Christine enjoyed yourselves. Both of you looked marvelous! I think we all had a lot of fun. I really admire your cats. They are gorgeous.